As the construction of his extravagant Ansonia Hotel on upper Broadway was nearing completion, the somewhat eccentric millionaire William Earle Dodge Stokes paused before a photographer’s shop on Fifth Avenue. There in the window was a portrait of 19-year old Rita Hernandez de Alba Acosta. The 43-year old Stokes was immediately smitten. 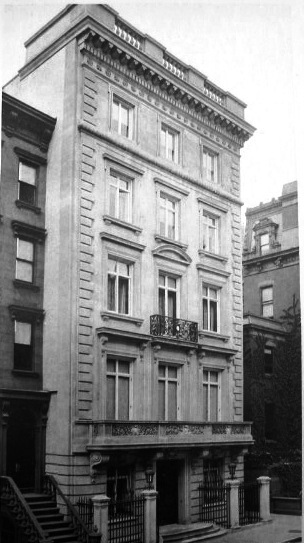 On January 3, 1895 the couple was married in the bride’s parents’ mansion at 48 West 47th Street where Archbishop Corrigan performed the ceremony in front of 1000 guests. “No wedding this season in New-York has attracted more interest among society people” reported The New York Times. Although those “society people” generally looked askance at Stokes – he preferred not to engage in social affairs and dressed “oddly” – he attempted to fit in for the sake of his bride. In 1897 he rented the Newport cottage of publisher James Gordon Bennett where Rita hosted an opening dinner party for 300. A year later, on June 7, Stokes spent $140,000 on the two 4-story brownstones owned by Mrs. Caroline G. Reed at Nos. 4 and 6 East 54th Street. In their place he commissioned McKim, Mead and White to design a white marble mansion for his new bride. The firm produced an Italian Renaissance-style town house worthy of 5th Avenue, just around the corner. A carved marble balcony stretched the length of the second story above a rusticated ground floor protected by a marble and cast iron fence. The home rose five floors to an elegant, classic marble balustrade on the roof. However things were not going well in the Stokes household and, just as the house was nearing completion, Stokes sold it on December 14, 1899 for $325,000. Four months later Mrs. Stokes filed for divorce. The elegant marble mansion was purchased by Chicago lawyer and business mogul William H. Moore and his wife Ada. The fantastically wealthy Moore was the founder not only of U.S. Steel, but of American Can Company, Diamond Match Company, National Biscuit Company (later renamed Nabisco) and several railroads and banks. The Moores were important social figures, Mrs. Moore filling the house with Asian antiques and hosting numerous lavish parties for opera figures and New York’s elite. William Moore died in 1923 and Ada remained in the house until her death in 1955. Subsequently the home was used by a succession of commercial and charitable tenants; yet none of them disturbed the original interiors. When, in May of 1993, the Banco Di Napoli purchased the mansion from the government of Indonesia for $12.8 million, the original stained glass, the five-story winding marble staircase, the inlaid floors and the ceiling details were all intact. The bank commissioned Americon, Inc. to restore and renovate the structure, adding two floors in the process, invisible from the street. No. 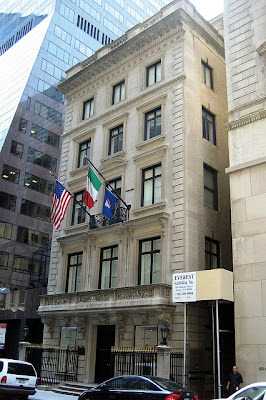 4 East 54th Street looks today much as it did when William and Ada Moore first entered it in 1900; an elegant and beautiful survivor of 5th Avenue’s magnificent residential era.